Stepping back and forth between the world’s two longitudinal hemispheres is fun in a quirky sort of way. Of course it requires you to be positioned right above the Prime Meridian. And that, in turn, means you must have decided to spend a London afternoon over in Greenwich, a few miles down-river along a now much cleaned-up Thames and more or less across from Canary Wharf. If you’d somehow been asleep for a quarter of a millennium, and were wholly unaware of Britain’s Empire years, you’d soon be set straight when you visited Greenwich. It’s magnificent! My wife and I spent a day this past weekend re-acquainting ourselves with this London borough where you’ll find the National Maritime Museum (magnificent! ), the Old Naval College (which in its original incarnation had been a retirement home for Royal Navy sailors and is partly a Christopher Wren creation with a splendid chapel), the seventeenth-century Queen’s House, a Greenwich Market first established over three centuries ago and, of course, the Royal Observatory. It’s at the last of those listed attractions where one can hop between hemispheres. Remember, the east-west division of the world is wholly arbitrary in a way that the north-south split is not. The equator is a fact imposed on the world. Where to draw the up-down line to split the world’s west from its east is a function of nothing more than who happened to be drawing the line and what they prefered. At the height of the British Empire, the world’s largest-ever, the people doing the preferring were in London. And so the Prime Meridian runs right through the Royal Observatory at Greenwich. That is why, before political correctness infected everything from banning temporal reference to the shorthand of ‘Before Christ’ to toilets and ‘renewable energy is cheaper if you just ignore the $3 billion in subsidies it gets each year’, we used to talk in terms of Greenwich Mean Time. Everything was based on that, and the arbitrary line drawn there to separate east from west. Anyone know who unveiled the statue at the official ceremony? I just learned the answer this past weekend. 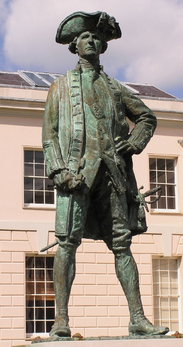 If you answered ‘the Marquis de Montcalm’, a direct descendant of the losing French general at that 1759 battle, then give yourself a huge pat on the back – you are a trivia God. Here’s another bit of trivia that Australians might have a better chance of knowing. 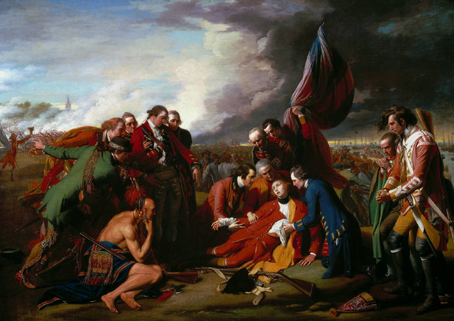 To get behind the French lines on the fields of Abraham General Wolfe’s troops were navigated up the St. Lawrence, at the time a task commonly thought to be impossible, by a young Royal Navy lieutenant. This was a man who would go on to have more than a little importance in the future affairs of Australia. In fact, he has more than a few statues in Australia today, all of which the crazier elements in the Green Party (read ‘the whole party’) and the left-wing of the Labor party would like to pull down or at least deface. For products of the modern education system who might still need a little help, his Greenwich is at right. Here’s another random fact, one I happen to find particularly pleasing. Both Wolfe and the young Royal Navy lieutenant, who went on to find an even wider fame than the General’s, shared the same Christian name (another term seemingly been banned by the keepers of PC orthodoxy.) Mine. At any rate, I came back from the day at Greenwich thinking I might re-read Niall Ferguson’s Empire. It’s a powerful defence of the British Empire and documents a time when Britain’s political class was (I put this as neutrally as I can, you understand) somewhat more vigorous than today’s in standing up to the undemocratic forces that ruled Europe and did their best to bring Great Britain to its knees. 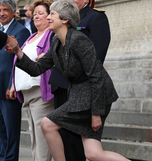 Jump forward a couple of centuries and British PM Theresa May begins all negotiations with the EU already on her knees. She surrenders before she tries anything else, and if that isn’t working she tries surrendering some more. This, alas, is the result of a Tory party deciding it would be a good idea to put a confirmed Remainer in charge of negotiating Brexit, who in turn stuffed her Cabinet with Remainers. At this stage only the adamantine obtuseness of the EU can save Brexit. The Tories don’t deserve that sort of luck. All told, this Tory Party-led fiasco is a much worse sell-out of their core voters than what we’ve seen with Australia’s Liberal Party under Turnbull and the Black Hand faction. And that’s saying something indeed! Such a good overview of Greenwich and British triumph but why does my mind picture the reference source ‘Jane’s fighting Ships’? Regardless, victory against the French at Quebec was monumental. The British troops secretly climbed the escarpment to the Fields of Abraham, just outside the French fort, through poison ivy and some brave souls were in kilts said our Italian/American tour guide. The tour guide was a little unfair when he first asked why the courageous British wore redcoats? To conceal any bloodstains caused by enemy musket balls he said. Then the guide asked why the French wore khaki trousers? It is indeed hard to comprehend how the Tories, especially, are prepared to sell out the national sovereignty. Not only that, the Tory Government is overseeing just about every PC lunacy imaginable whilst removing freedom of speech and now of thought. Could a Corbyn Government be any worse? @Davidovich. The Tory party is the only party capable of governing Britain, if it could get its house in order. This is not going to happen any time soon. Something is happening in Europe that is unprecedented. It’s called a paradigm change. Nothing like it has happened in our known and recorded history. Cameron’s government was the last to govern, if only just. His main claim to fame is calling the referendum. He did not much else in the way of running the country. Since July 2016 nobody has been in charge of the running of Britain. May rule has been mis-rule. I have been reading Tim Shipman’s take on this, All Out War and Fall Out. They are essentially novels based on some kind of real surreality. In Britain, the politicians have gradually gone insane. Almost as if the gods have decreed and engineered it. This is how fundamental change happens. The old order goes off the rails. They know it, everybody knows it, but it is not being acknowledged, for to let on and allow the public realise what is happening would give the game away. It has to sink in slowly, so the globalising corporates will be able to gradually take control. The old order EU cabal must by now be aware of the looming terminal velocity of the unwinding of their pet project. They will surreptitiously merge their business with the new world order overseen by the globalists, enabled by the West’s progressives stooges and made possible by a supine and clueless western demos. The transnationalists are already well dug-in in Europe. The old guard in European business, in France and Germany mostly, who have thrown in their lot with the elite running the EU federalisation project and are philosophically tired, and tied down, have lost it. They are riding the EU trainwreck into the old and tired Europe sunset.